Get ready to snuff out your opponents with this Spider-Man villain! 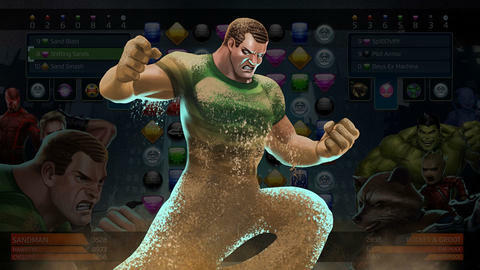 Sandman, the original Spidey villain, brings his coarse, rough, and irritating particulates to the “Marvel Puzzle Quest” universe. Flint Marko joins the roster ready to suffocate his opponents underneath a mountain of sand and D3 Go! Producer Josh Austin’s here to tell us how he’s gonna do it! Marvel.com: With the addition of Sandman we’re about a third of the way to a full Sinister Six! What’s so special about Flint Marko? Josh Austin: We are very glad to bring Sandman (Flint Marko) as a new Super Villain to Marvel Puzzle Quest, and right after the release of the new Doc Ock 5-Star character. Sandman brings with him some great abilities to the 4-Star roster including a team damaging attack that also stuns a target, and he has a power that moves basic tiles around and converts some of the moved tiles to Yellow basic tiles to help generate Yellow AP. Marvel.com: There’s so much that a man made of sand can do, from creating constructs to quicksand, to turning himself into a sandstorm. What did the team focus on while building Sandman? Josh Austin: Sandman may not create a storm this time around, but he does some heavy hitting and board manipulation with his sand particles. His three powers have him forming a hammer out of sand to smash his opponents, pinning an opponent with a blast of sand that also damages the rest of his opponents, and he also changes shape maneuvering around the battlefield moving tiles around to his advantage while his enemies are distracted. Marvel.com: Mind giving us the lowdown on Mr. Sadman’s abilities? Josh Austin: Sandman’s first ability is called Sand Blast and it costs 9 Green AP. For this power, Sandman fills the area with sand from his limbs, pinning his target. This deals damage to the enemy team and stuns the target opponent in front. His second ability is called Shifting Sands and costs 8 Purple AP. Sandman changes shape keeping the enemy off guard and moving around the battlefield to swap non-Yellow basic tiles around and converts some of those basic tiles to Yellow. Lastly, Sandman has Sand Smash which costs 10 Yellow AP. For this ability, Sandman turns his arm into a giant hammer of hardened sand, which creates Protect tiles or deals damage by removing friendly Protect Tiles if the player has enough of them on the board when initiating this power. Marvel.com: I’m really liking the AOE damage and stun in Sand Blast. It feels like he needs it to help him really get going and create those Yellow and Protect tiles to pull off the big damage later. Josh Austin: It’s definitely one of his two unique abilities, it’s a great way to deal consistent damage and stun a specific target for whatever the situation calls for, delaying a Countdown tile, putting an opponent on hold for a bit to deal with a different one, etc. Marvel.com: Outside of extreme heat turning his sand to glass, what sort of weaknesses does the big galoot have? Josh Austin: Of course intense heat, handclaps from Hulk and water are devastating to Flint, but for Marvel Puzzle Quest he’s weak against characters that remove Protect tiles like Doctor Strange, etc. Marvel.com: And it seems like anyone who creates Protect tiles will help him pump out those Sand Smashes. So the Falcon, Luke Cage, maybe a Mr. Fantastic? Josh Austin: You are correct, people that create Protect tiles like Iron Man (Hulkbuster), Wasp (Janet Van Dyne), Sam Wilson (Captain America), Luke Cage (Power Man), Invisible Woman (Classic), Mr. Fantastic (Reed Richards) and Gwenpool. Another good teammate would be someone that Generates Purple or Yellow AP like Kingpin (Wilson Fisk) or Scarlet Witch (Wanda Maximoff). Marvel.com: So when do we get to build sand castles with Flint Marko? Josh Austin: Sandman (Flint Marko) will be available June 15. He will debut in Thick as Thieves that starts June 15 and he will be featured in the June 19 Strange Sights event. Sandman’s Versus event is called Sandstorm and will begin June 22. Try out Sandman for yourself here and stay tuned to Marvel.com for more “Marvel Puzzle Quest” news and interviews.